Forget smartphones and tablets – The next big tech battle will take place in the car. In-car technology is getting better and companies are vying to be at the forefront of the "infotainment" revolution. It’s unclear why it has taken so long for car manufacturers to improve the on-board technology in their cars, but finally they are working together with tech giants to install improved systems in their automobiles. While not comparable to current mobile technology in terms of system specifications, it’s obvious that there is a push to integrate mobile features into cars to transform the way we use navigation, entertainment and internet services. Google and Microsoft have already produced operating systems for certain manufacturers, however the dashboard mounted interfaces are very basic which has led to a push to revamp and reimagine the way technology is implemented in cars. Ford has possibly identified that consumers desire high quality in-car systems, and could ditch Microsoft as their current provider. Surprisingly, they look to be turning their back on the “Sync in-car infotainment system” and have reportedly looked to Blackberry for improvement. The “poorly designed” and “cumbersome” system has been shunned by its users and in 2013 a lawsuit was filed against Ford after many drivers complained about the system freezing or blacking out. This would be a big loss for Microsoft as Ford is the largest customer of this technology and a shift to Blackberry sees them join the likes of BMW, Audi, Chrysler and Porsche amongst others as adopters of the QNX system. Blackberry’s QNX has been called a crown jewel of the company by CEO John Chen and it’s easy to see why as Apple has become the latest (and arguably most important) company to utilise QNX as part of their own technology. Those of you with Apple devices may have noticed something called Carplay included as part of the iOS 7.1 update, details of which were revealed at the 2014 Geneva Motor Show. 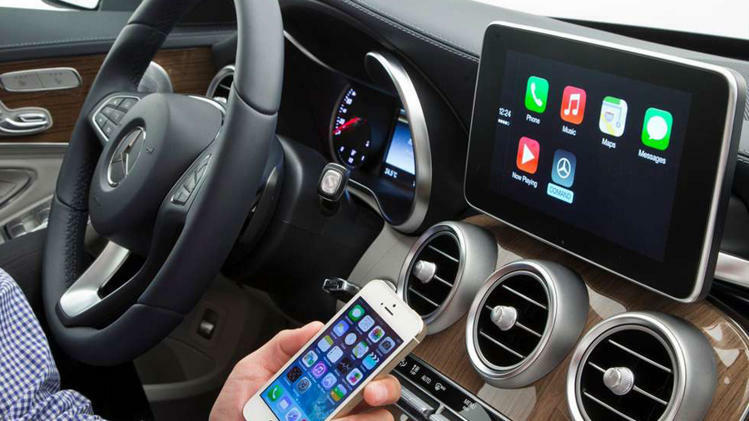 Although there are no cars able to use this technology currently, many new vehicles will come compatible with Carplay, giving Apple a leg up on the market. Users will be able to sync their phone to their car via usb, and use their iPhone’s functionality on the dashboard screen. This will extend to apps such as iTunes, maps and video services. Eventually third party apps will be available with Spotify already confirmed. Sometime in the future we could see Siri activation of certain features in the car. “Siri, turn on windscreen wipers”. Sat Nav devices will become redundant and we may have a completely new driving experience in terms of navigation. Traffic information could be automatically updated and your route adjusted accordingly to find the quickest possible route. We’re a long way off from that, but it isn’t such a futuristic idea anymore. This shift of focus to in-car technology may prompt app makers to create versions of their apps that are compatible. Take Spotify for example, they have teamed up with Volvo to create an integrated touch screen music player. Using a mobile internet connection such as a mobile phone or dongle, drivers will be able to stream music on the go. Volvo’s in-car system is built using Android technology, and many predict that despite the introduction of Apple Carplay, Google will have the market sewn up very soon. They are yet to unveil “Project Mode” which is expected to directly compete with Carplay. It looks as though some car manufacturers, such as Mercedes, will look to allow drivers to sync devices regardless of their operating system, but with Google rumoured to be heavily involved in driverless car technology, they stand to have the monopoly in the long term. The possibilities for receiving information and entertainment in the car are certainly exciting, but with added connectivity comes added concern about privacy. Will location data be provided to the government? Perhaps speed data and location times could be seized by police in the event of an accident or crime. Data taken from your car could be used to target drivers for marketing purposes too. A dashboard screen provides a handy mini-billboard, but further down the line we could be looking at roadside billboards that communicate with your car to display ads at the side of the road. There is also a big concern about safety. If app developers begin to make in-car applications, they will need to be vetted by both the app supplier and the car manufacturer to ensure they won’t be distracting or unsafe. If an app is found to be a contributing factor in an accident, it could be complicated when determining who is liable. So while it is exciting to see these tech giants innovating in-car systems, there are plenty of kinks to be ironed out before we start to see something anywhere near perfect. We are potentially on the edge of a monumental change in the way we drive, and while music and map apps might seem frivolous or gimmicky, they could eventually determine how we operate our cars.